I need a little more culture in my day-to-day life. New York Fashion Week started off as the root of the problem - I've been debating with myself on which season to escape to New York to and have been caught up in the fantasy of their Winter Wonderland. I just want layering - with dresses over pants, coats overs coats, and scarves the size of blankets (I will ignore how miserable people tell me New York is in Winter). I want Central Park in the snow (thanks Nicole for setting the expectations very high), I want spiced hot drinks and cozy apartments. I can do without the rain though (for blog photo's sake). And now, I'm so over the warmer weather that I find myself saying what gives? I've been using the official end to the sunny season as an excuse to put my heater on in the mornings and wear layers around the house (look I'm just always cold okay? ), and it's disappointing when my elaborate outfit planning doesn't match the weather for the day.. I came to realise that I think I just rave about Summer because of the thought of somewhere exotic (please send me on a holiday), and Winter if it's somewhere where there is culture, and people celebrate the holidays and seasons as they should be celebrated (again, please send me on a holiday). I spent all yesterday at the Ventana Fiesta Festival, which is a local festival that comes once a year to celebrate the vibrant world of Latin America, Portugal and Spain. I felt like I was in a completely different country, yet I was standing near the cinemas that I've visited so many times before in that town. I had bean tacos, a Mexican BBQ panini and churros, and stood back and people watched as they celebrated the culture with traditional dancing, market stalls and live bands. As much as I love Australia, culture is something we greatly lack. Melbourne is known as a very multicultural place and it's great, don't get me wrong, that we're a country that celebrates so many cultures and is accepting of other traditions, as well as being able to experience cuisines from around the world - but I feel like it's time for Australia to step up its game a little. Let's get past this mentality of BBQ's and slang being enough for our nation's representation. I get that our holidays aren't in conjunction with the seasons as they are in the North, and that our weather works a little differently in general (with our lack of snow and no extravagant pool parties - Mary-Kate and Ashley films are also to blame here), but let's not get boring. I'm sure we're able to think of something - give me some culture, please. You look beautiful! Your shoes are delightful! These shots are so beautiful, I love the light and of course your outfit! Love this post!! Always amazing to hear perspectives on different cultures :) Your outfit is way too perfect and we're adoring the slides. You might be inspiring us to give them a try. So cute on you! Love your photos and the outfit and the makeup and the shoes! And I, coming from Northern Europe can't simply understand how someone can be "over" summer and wanting winter. Here we're just starting to get lovely spring weather and people are instantly happier after the grey and moody winter days. Lovely look! 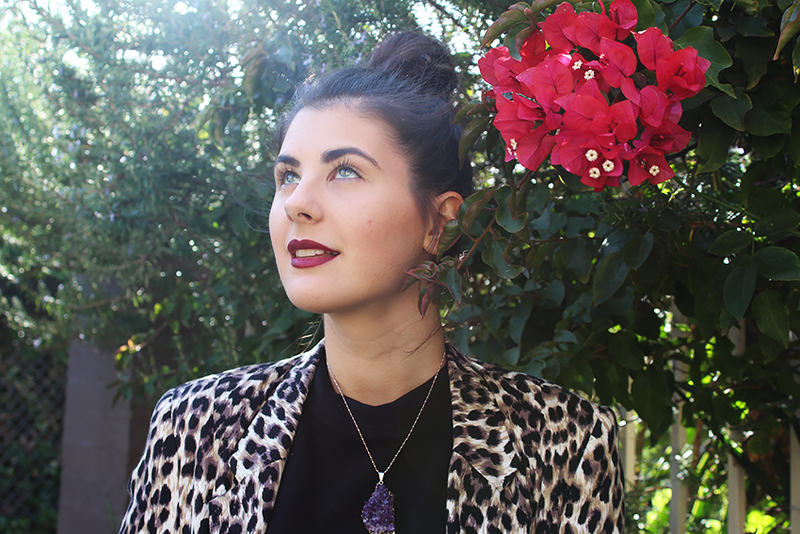 I like this animal print blazer and your necklace! Beautiful look, I love your style! I wore them non-stop while travelling. Perfect for it! Luckily this is right next to my house, so it seems to be the go-to place when I don't want to travel far haha. Thank-you miss! Definitely give them a go. Also I think blogs are the perfect place to learn new things rather than just stare at pretty pictures haha. More views on interesting topics is something I'd love to start seeing more of! Isn't it for everyone? I'm bursting to experience it! 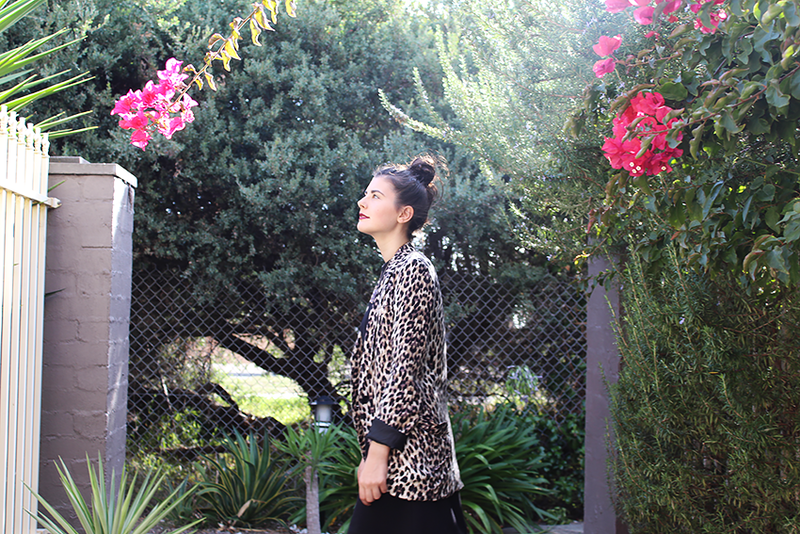 Love the way you have styled that animal print jacket! And those sandals are the epitome of Jesus Sandals, so nice! !